Dual Line Lubrication System that we offer is well tested and therefore, is the perfect option on which buyers can easily rely. We are reckoned as one of the reputed Manufacturers and Suppliers of Dual Line Lubrication System. Manufactured under the strict vigilance of experts, our Lubrication System is known for its longer functional life. Tested using the latest techniques, our Lubrication System is free from all kinds of defects. Principle of operation : Two parallel lines run from pump to control valves and from control valves to metering devices and then to bearing points. End of line pressure switch gives signal to change over the line and thus continuous operation is ensured. A single outlet pump, 4/2 way direction control valve, metering devices, end of line pressure switches etc. are important parts of the system. In this system, lubricant is supplied from central pump to control valve, which further supplies it to the main lines and ultimately to bearings. 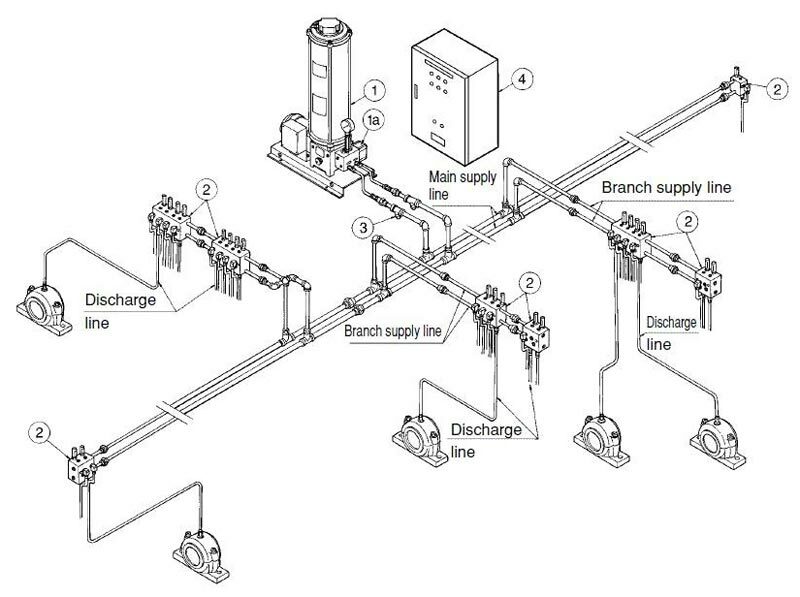 When pump os started, one of the main line gets charged, it delivers required quantity of lubricant to bearings and at that time other main line acts as a relief line. When end if line pressure switch sends signal to changeover the line (i.e. half of the total number of lubrication points are covered.) After getting signal from end of line pressure switch, the changeover valve operates and the other main line gets charged and remaining half number of lubrication points gets lubricated. This ensures one complete cycle. Advantages of this system is that the pump used is high volume, high pressure type and number of bearings can be centralised is large (up to 1000 points). Sugarcane Crushing Mills, Steel Rolling Mills, Metal Processing Machines, Power Plant Conveyers and Grate Coolers.